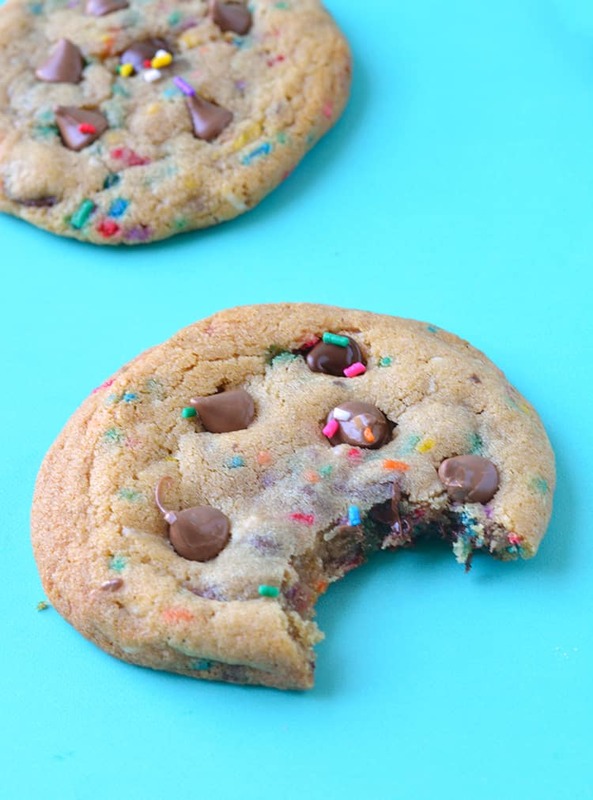 Golden Funfetti Chocolate Chip Cookies packed with chocolate chips and sprinkles. There’s no need to chill the dough so these chewy cookies are ready in just 30 minutes. Meet my new favourite cookies. 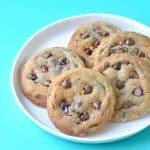 Golden, chewy Funfetti Chocolate Chip Cookies filled to the brim with chocolate chips and colourful funfetti sprinkles. These big, buttery cookies are my kryptonite. There is something therapeutic about making a big batch of cookies. 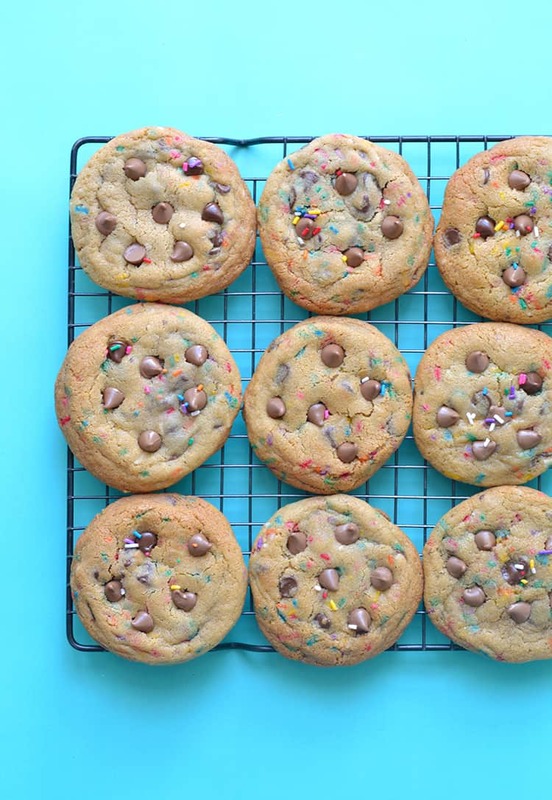 And these Funfetti Chocolate Chip Cookies are no exception. They’re quick and easy to make, with no need to chill the dough. 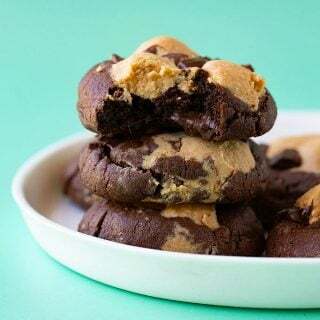 And with almost a cup of chocolate chips stuffed inside the cookie dough, they’ll satisfy ALL your chocolate cravings. To make these cookies, you first need to cream the butter and sugar. For these cookies, I use a combination of caster sugar and brown sugar. Brown sugar is my secret weapon in cookies. It adds so much flavour. And vanilla. I add vanilla to e-v-e-r-y-t-h-i-n-g. The best part? The fix ins. We’re talking almost a cup of chocolate chips and a ton of funfetti sprinkles. Can you even? 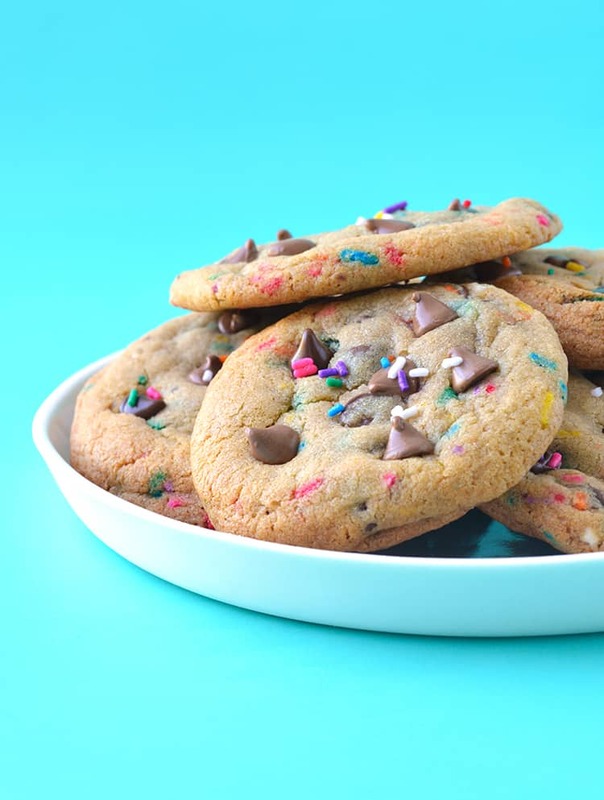 My only advice is to invite friends over when you bake these because these Funfetti Chocolate Chip Cookies are I-R-R-E-S-I-S-T-I-B-L-E.
Make sure your butter is at room temperature – not fridge cold and no gooey and soft. Never put your cookie dough on a hot cookie tray, it will cause the butter to start melting and the cookies to spread too much. Cookies firm up as they cool, wait a few minutes before carefully sliding them to a wire rack to cool completely. For more cookie tips, check out this post. 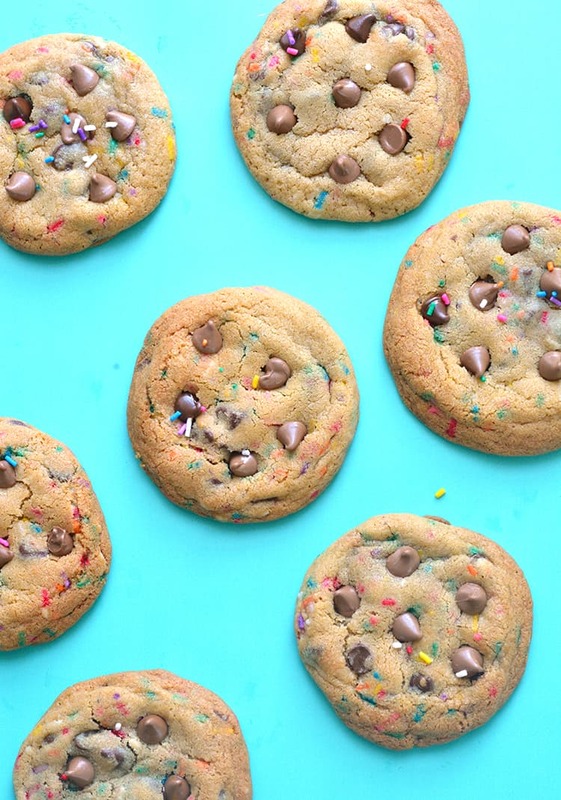 Golden chewy cookies packed with chocolate chips and sprinkles. Line two baking trays with baking or parchment paper. Preheat the oven to 180 C (360 F). In a large mixing bowl, beat the butter and sugars using an electric beater for 1-2 minutes or until pale and creamy. Add vanilla and egg and beat until combined. Sift in flour, baking soda and mix to combine. Add chocolate chips and sprinkles. 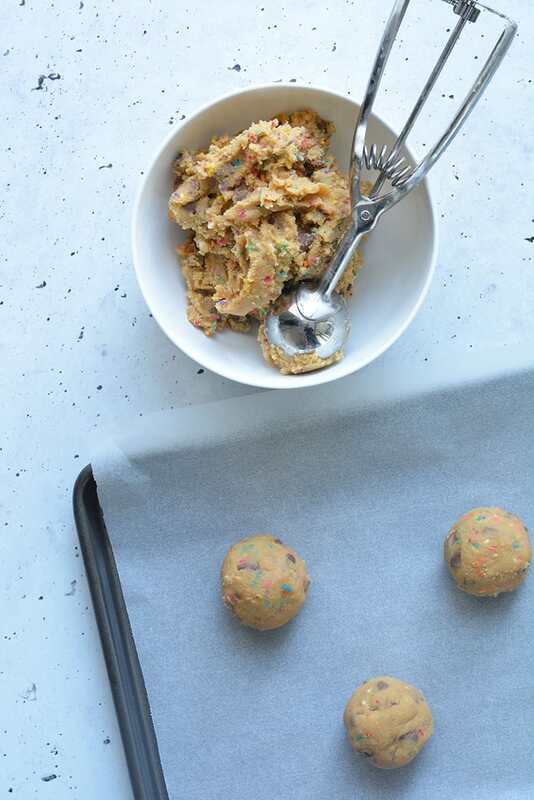 Use a cookie scoop to roll balls of dough in your hands and place them onto your prepared trays, leaving room for the cookies to spread out. Bake for approximately 11-12 minutes or until golden brown on the edges. 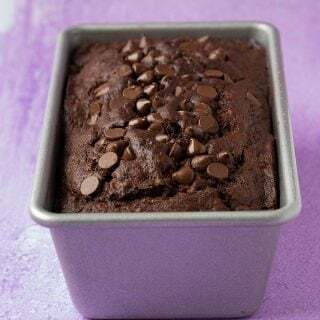 Press a few extra chocolate chips on top. Carefully transfer to a wire rack to cool completely. If you prefer a thin and crispy cookie, add 1/4 cup (35 grams) less flour. Just a tip–use LIGHT brown sugar not DARK. I only had dark in the house so I figured it would be alright–the extra molasses content took all the chew out of the cookie and I had to make a second batch! Also if you find your cookies to be a little too dry add 1/2 teaspoon of milk. My cookies came out chewy and gorgeous after doing that. How large are the dough balls for this cooking time? Hi Peter! My cookies are roughly 1.5 tablespoons of cookie dough or size #40 cookie scoop. Hope you enjoy them! 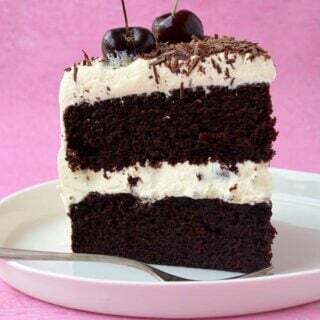 These look so delicious and so easy to make! Those teeny sprinkles are so adorable!! 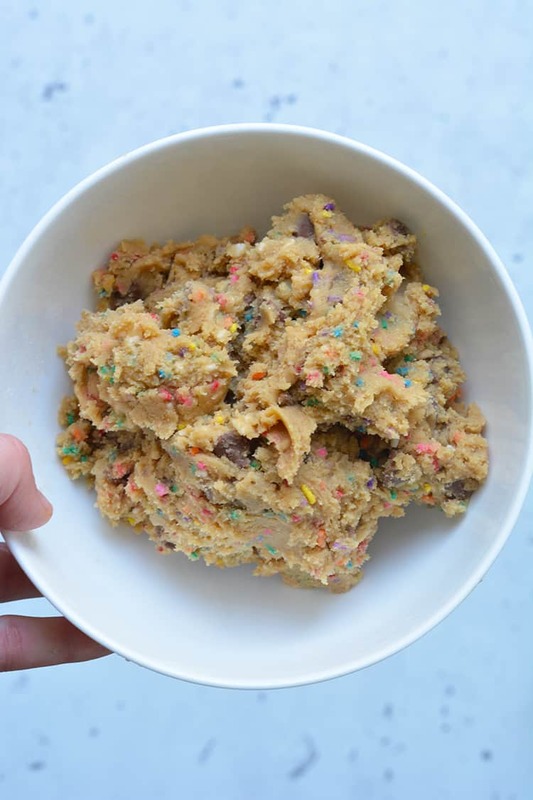 Well… I’m thinking I need some sprinkles up in my classic chocolate chip cookie recipe really soon! Sprinkles just make everything better! These cookies are so cute! I could imagine kids or anyone gobbling them up in a hurry. Totally Amanda! I know I wanted to gobble them all! Oh! These are SO fun! Perfect for a party! These are true party cookies!!! I love a thick cookie but honestly, cookies are always delicious not matter how thick or thin they are. I’m always up for a party! And sprinkles make everything better. They add a little flair to a classic chocolate chip cookie! I couldn’t agree more, they certainly do! Oooo I want them all! Chewy cookies are my favorite! Love the pretty sprinkles! They look perfect! How fun are these colorful sprinkle-loaded cookie beauties?? I seriously just want to grab a handful out of my screen and go cookie crazy! They look perfect, Jessica! Thanks so much Sarah! Aren’t sprinkles so much fun?